Have you ever wondered what it’s like to be truly free in your imagination? To be without a care, without doubt of your abilities, fear, and without a thought about what other people would think if you just… let go and cross over to the dream state in an instant? Have you ever thought about what it would be like to be truly…UNLIMITED? 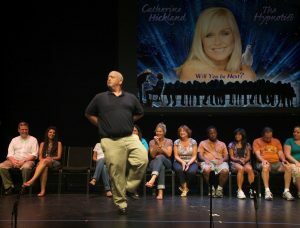 Welcome to Catherine Hickland’s Hypnotic World. One of the very few females in the field of hypnotism, this Las Vegas Trained Hypnotist has hypnotized FOX news reporters and hosts as well as countless DJ’s across the country, earning her the nickname, “The Hip-Hypnotist”. Catherine Hickland is an American actress and singer, who has spent nearly three decades in starring roles in soap operas on all three networks. She is best known for her twelve years playing the award-winning character of Lindsay Rappaport on ONE LIFE TO LIVE until the show ended it’s 45 year run in 2012. She also held the lead role of the tragic heroine, Fantine, in the Broadway Production of Les Miserables. Catherine is beloved by Knight Rider Fans all over the world for her role as ‘Stevie Mason,’ the love interest of the lead character, played by David Hasselhoff. She has also guest starred on many television series, including Law & Order. Because of her long and successful career in television, Catherine has International appeal, and enjoys meeting people from all over the world. As a young teen, Catherine was first inspired by hypnosis when she watched Pat Collins, ‘The Hip Hypnotist,’ in movies and on television; fascinated, she knew one day she would learn the art and science of Hypnosis. During the final two years on ONE LIFE, Catherine diligently studied the art of hypnosis, becoming certified in several areas of hypnotherapy. In 2007, she migrated to Las Vegas to further study the art of Stage Hypnosis. In 2008. Catherine debuted her show in New York City at the prestigious New World Stages, and has been inspiring audiences with entertaining and powerful demonstrations of the power of the subconscious mind ever since. Today, Catherine is one of the most successful and well-known female hypnotists in the country. She performs over one-hundred and fifty hypnosis shows a year. Catherine is also a popular speaker and the author of ’The 30 Day Heartbreak Cure, a Guide to Getting Over Him and Back Out There One Month From Today’ (Simon & Shuster) as well as “Cat & Fern’s Excellent God Adventure Daily Inspirations for 365 Days of Heaven On Earth.” Her latest Book, ‘Get Your Fire Back’ is due out in winter 2017. Trained by Anthony Galie and James Mapes, in 2016 She launched her career as a Corporate Keynote Speaker with a program that combines strategic hypnosis inside of her keynote speech to demonstrate the power of the mind and how we miss out on opportunity by the way we think. Cat is married to the son of Debbie Reynolds, producer Todd Fisher, they live, and love, in Las Vegas, Nevada. Media Partners: ABC 12 FOX 24 WGXA, Cumulus, and The Telegraph.